This is part 3 of the series “Housing in MMOs”. After looking at Lord of the Rings Online and Aion, I will focus on Rift today. The most important difference to other games is that you do not get a “house” in Rift. You get a “dimension“. This dimension is a small instanced map of a region that exists in the actual game. So, you will not be able to get just any region in the open world. But you can buy a dimension version of it – as long as Trion Worlds added it as a dimension, of course. Not all areas are available, as you can probably imagine, since the world maps of MMOs are usually very large. Is there a minimum level required to get a house? No. You get your first tiny dimension for free as soon as you reach the NPC who gives you the quest for it (“Sanguine Shore” for Guardians and “Warden’s Point” for Defiants). This means that you need to leave the instanced tutorial area and then walk to the respective NPC (this one differs for the two factions in the game). It’s not difficult at all and you can comfortably go there as a level 7. For this article, I created a second account to test some things out and see where the limits of dimensions are when you haven’t spent any currency (in-game or real) on them yet and when she reached the NPC, she had just hit level 7. Warden’s Point. The free dimension for Defiants. Sanguine Shores. The free dimension for Guardians. Sanguine Shores. A treehouse made by the player Bookarion on EU-Gelidra. Sanguine Shores. Little vacation paradise by player Risanne on EU-Brutwacht. Is there a fee/a recurring fee to keep the house? Yes and no. As mentioned above, you get your first dimension for free. This is just a tiny dimension, though. It’s cozy and all that and even comes with a small shrine, but you will probably feel its limits very fast. Its area isn’t as big or as high as others, for example. All other dimensions need to be bought. The prices vary depending on the size of the dimension. 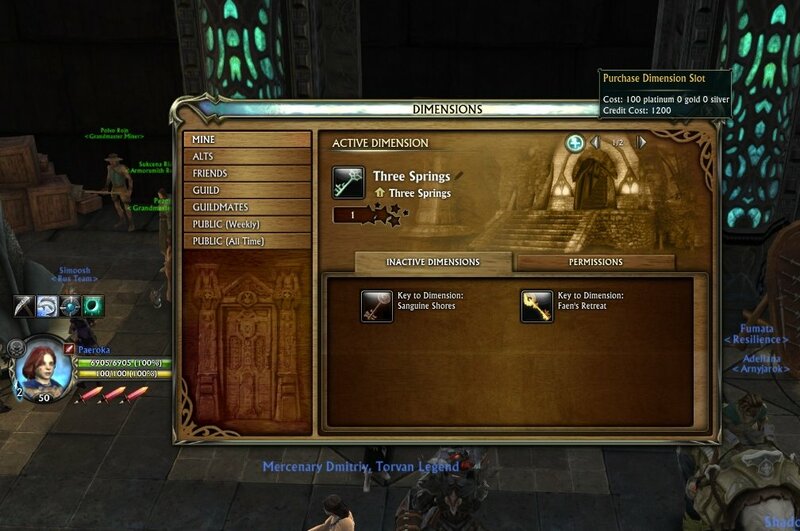 Most dimensions can be bought with either in-game currency or credits. Credits are bought with real money OR via REX which is worth 1250 credits – and 2500 loyalty – and currently costs about 1500 platinum on my server. 1500 platinum isn’t something a new player just earns within a few days of playing, though. So it’s not cheap, but I think it’s a good alternative for those who have been playing for a longer time and have a source of income in the game. The cheapest dimensions cost 10 platinum or 170 credits (if you do pay for a sub, called “Patron time” in Rift, you get a 10% discount when buying something with credits). The most expensive ones cost 900 platinum or 1700 credits. Once you unlocked a dimension, you own it, with no recurring fees. I assume this is because there are no neighbourhoods like in Lord of the Rings Online or Aion. It doesn’t matter how many dimensions are owned by players or if a player who owns a dimension leaves the game. Supply isn’t limited, so there is no need for a recurring fee. Which choices do I have when it comes to my house? A lot, actually. At the moment, you can buy 17 different dimensions with platinum or credits. Then there is your free dimension that you get at the beginning. Additionally, there is one dimension (Strozza Estate Villa) which you can only buy for a special in-game currency that you earn by completing different things like achievements. You cannot buy that one with credits! One word of warning: If you fall in love with Faen’s Retreat (like I did), think twice before purchasing the key in the store. When you finish the first tier of loyalty (earned through spending credits and/or REX), you get that dimension as a gift for every character on your account! That’s a much better deal than just buying one key for one character. In the higher loyalty tiers, there are currently two more dimensions to be earned which you can’t get in any other way. But those loyalty tiers are pretty high up, so you’d have to spend quite a lot of money or REX to get there. The next patch will introduce “roughly 15 new dimensions”. The keys (which you need to own and use to unlock a dimension for yourself) for those will be crafted by the new crafting profession “Dreamweaving” that will also be added with the next patch. Rejoice: You do not need this profession in order to get your hands on the dimension keys. You will be able to buy them from other players in the auction house! Is there an item limit? What about item placing? Yes. This seems to range between a minimum of 50 items and a maximum of 2250 items for personal dimensions and up to 4000 items in guild dimensions. Your free dimension comes with an initial limit of 50 items. You can upgrade your dimensions to be able to place more items. 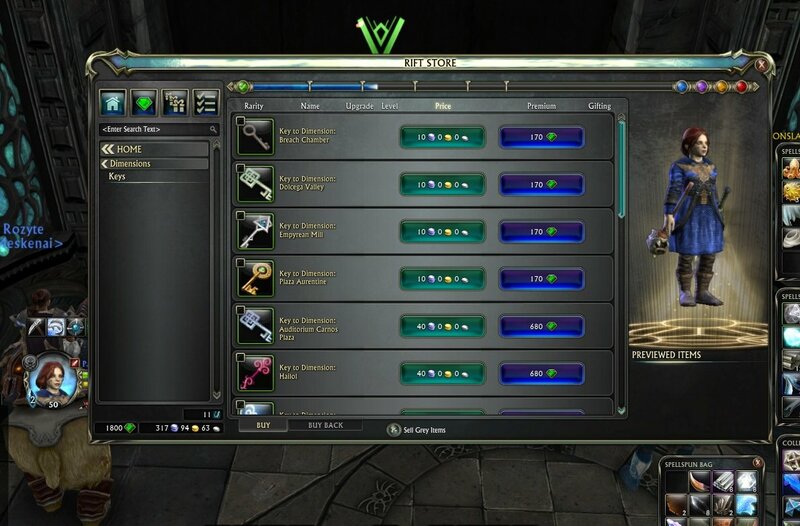 The first upgrade for your free dimension brings you to 75 items for the cost of 1 platinum or 1 credit. The maximum item limit for the free dimension is 400. Bigger dimensions have a bigger maximum item limit. Faen’s Retreat comes with an initial limit of 190 items. The first upgrade costs 10 platinum or 5 credits and lets you place 285 items in there. They have changed the maximum amount of allowed items a few times in the past, but they are apparently at the current possible maximum. Items can be placed anywhere in your dimension! You can also rotate them and resize them. They can also be clipped into one another if you want to make new items (bags of flour stack together nicely to make a couch). Can you expand the house? Yes and no. You cannot expand the map of your dimension. You can expand the item limit as mentioned above. And you can build new houses, temples, whatever you want in your dimension or add to any structures that are already there. For example, add a balcony by placing a stone floor or wooden planks. You can also place prebuild huts and houses that you can buy. So it all depends on the definition of “expanding” here. The general layout of the dimension is determined by which dimension you have. Faen’s Retreat is a deserty place which comes with one hut and a small oasis in the middle of some hills. So the hut and the oasis are always there. Usually, you can build quite high up in dimensions (and there is no fall damage – don’t worry about getting up there! ), so you can build not only your own houses, but you can also build a skyscraper if you want. If building something from scratch isn’t your thing, just settle with pre-build houses to add, or just fill the existing hut with some items and make yourself comfortable at the oasis. Are there any advantages when you own a house? This is actually a bigger deal in Rift than you may think at first. Since Rift features dynamic events (called “Rifts”) which open up in lots of places on a map and lets loose hostile NPCs, it’s always a wise idea to switch to your dimension when you want to go afk and leave the dimension again when you’re back. You will get placed exactly where you were before entering your dimension. It has happened countless times that I went afk on a street that seemed safe enough, only to be killed by roaming hostile NPCs that spawned on the map while I was away. Other than an afk-hideout, you can also get rested XP when logging out in your dimension. Rested XP give you an XP bonus when killing mobs. You also get the rested XP in your capital, so this isn’t an advantage over other players. But again, it is convenient, because you’re just a click away from your dimension wherever you are in the game world. What’s the maximum amount of houses per characters / per account? This is a trickier question to answer. As mentioned above, you need to buy a key for a dimension to unlock it with your character. You can unlock all available dimensions with your character. Unlocking means that theoretically, you have access to it. However, in order to access the dimension and be able to put items in there, you also need to activate it. Every character has two “active dimension slots” by default. Out of all dimensions you have unlocked, you can choose two and put them in those active slots. This is per character, so you can have more active dimensions than just those two if you’ve got more characters! Just unlock and activate the dimensions with your alts. That’s not the only way to get more active dimensions. If you prefer to have more active dimensions with just one character, you can also buy active dimension slots. The third dimension slot costs 100 platinum (or 1200 credits). I don’t know the prices above that one, as I have never bought another dimension slot. I prefer giving the other dimensions to my alts first, before I get more for my main character. And to be honest, unless you’re one of those crazy dimensioneers, I guess it’ll take quite a while to even fill two dimensions. If you choose to go this route, then you can end up with up to 20 active dimension slots. By the way, you can access and build in your alts’ dimensions with any of your characters (as long as they are on the same server, I assume), so it’s easy to manage and a much cheaper alternative than buying more active dimension slots. Yes, there are guild dimensions! Some are the same than regular player dimensions, but with a higher item limit, and some are exclusive for guilds. You can choose which member ranks are allowed to do what in your guild dimension, so you can all build in it together. I am actually not sure how many guild dimensions there are. I can see 5 possible guild dimensions in the guild panel, but since Trion Worlds has added dimensions in the past, this number could be bigger now. Our guild owns the Stone Flask Tavern, because I fell in love with that dimension and figured it would be even better to have it as a guild dimension! Unfortunately, guild dimensions do not serve any purpose other than being a convenient gathering place where you can also place combat dummies (those items are available for personal dimensions as well) and a bartender that gives you ale (also available for personal dimensions). Though I’m not sure that really counts as any advantage. In order to unlock a guild dimension, you need to pay a certain amount of platinum (no way to buy those with credits, apparently) and the appropriate guild level. Are there any limitations unless you pay real money? You’ll need 1500 loyalty to automatically unlock the last two restrictions (currency limit and auction house access). You get 2 loyalty per credit bought and another 2 per credit spent. If you could buy 375 credits, you would get 750 loyalty immediately. When you also spent them, you would get another 750 loyalty. Unfortunately, the lowest amount of credits you can buy is 975 for 5€. On the other hand, this purchase will immediately get rid of the platinum and auction house limitations. And you will have the full 975 credits to buy stuff in the Rift store. None of the credits get lost. If you want to try the game first and don’t want to invest any real money, you can do so! There are plenty of items you can buy from the dimension NPCs. With the introduction of the “free to play”-system, they added NPC wares to the Rift store. Look at the tab called “Dimensions” and you’ll find everything you need there. As is usual for Rift, most of the items there can be bought with in-game currency or credits. Choose your preferred method and start building! As you have seen in the starting dimension picture gallery above, you can do quite a bit with your free dimension. One thing that always bothers me a bit is that the borders of your dimension are invisible (you can see that in the video above). Of course, when going through a dimension, it’s good that you don’t feel like you’re inside a glass dome, but when you actually want to know the borders of a dimension, it would be great if we could toggle them on. There are two more things that I and others criticize. For me personally, it’s a bit lonely sometimes. Lord of the Rings Online has this cozy little neighbourhood where you can even see what your neighbour placed in the garden. Aion has whole villages – and that area had quite a lot of other players running around, actually. Both make it seem a lot more lively. On the other hand, how would they implement that in Rift? Since it’s instanced and there is no “house with garden” per se, it would be quite difficult or even restricting your creativity if you had to pay attention to a neighbour. Other than that, it feels like housing heaven to me. I can just be “lazy” and put finished items in my dimension and pretty it up this way, or I can start building my own furniture (using a stack of hay as a parasol, for example, or round cheeses as a sunlounger) and even whole houses! As a side note, in case I have made you really curious about what dimensions are out there: You can enter people’s dimensions without finishing your instanced tutorial. Create a character on any server you like, open the dimension window and just start browsing. Last but not least, this article would have been released much earlier if I hadn’t tried to find good screenshots of people’s dimensions. The issue wasn’t in finding good dimensions. The issue was that whenever I entered one, I ran around to spot every little detail and be in awe. There are some incredibly creative people around, to whom I sadly do not belong. But either way, I spent too much time fawning over other people’s creations and could not leave without taking lots of screenshots. Some of which you can find in the image galleries and the video. The border in a dimension. You can’t see it unless you get close to it. My Three Springs dimension. Quite empty on the outside. I did place all the huts on the right and the fence. Three Springs as it exists in the regular game world. I don’t remember whose dimension this is, unfortunately. But this is build from scratch! A room inside the house of the unknown person’s dimension. Faen’s Retreat. Almost the same angle than the empty Faen’s Retreat. I don’t know what it was that I didn’t like about Rift, but it certainly couldn’t have been its Housing system! I didn’t have the chance to try it myself as the last time I tried Rift was long before Housing was introduced. But this article made me want to go back at have another look! “It doesn’t matter if a player who owns a dimension leaves the game. Supply isn’t limited, so there’s no need for a recurring fee.”. See if I got this right: you unlock a dimension by purchasing its corresponding ‘key’ from the shop. Then this dimension is unlocked character-wide and not account-wide (with the exception of only a few of them, like Faen’s Retreat) and each new character who wants it must buy it again. Am I right? Then each dimension has (at least or exactly?) one building inside it and you can add more either by building them (how? by combining pre-fabricated objects?) or buying them off the shop and placing them there. About active dimensions: you said “This is per character, so you can have more active dimensions than just those two if you’ve got more characters”. If character A has activated dimensions #1 and #2 and character B has activated dimensions #3 and #4, can A access/enter dimension #3 for example? Or is that what you mean by “This is per character, so you can have more active dimensions than just those two if you’ve got more characters”? Not every dimension has a building in it or something you can call a house. With the next patch, there will be one dimension called “Anywhere” which is just a barren flat area. Nothing on it, no plants, no trees, no hills, no houses. Perfect for building from scratch! You can either buy a house (I once fished one up! ^^) or you can build your own ones. The pictures I sent you some time ago – and that I uploaded here as well, the ones from Faen’s Retreat with the Greek flat – show buildings that are self-made. Wooden panel by wooden panel… or whatever else they used. :) The pictures from Three Springs shows one big building on the left that exists in that dimension already and the others on the right were bought and placed by me. I did not build them myself! That Asian-style building is also made from scratch. There are building blocks like wood panels, flagstones etc. that you can resize and rotate and place, so they can form floors, walls, a roof. Paeroka has the starter dimension, Faen’s Retreat, Three Springs and Shoreward Island unlocked. I put the biggest ones, Three Springs and Shoreward Island, into the two active dimension slots. My cleric has the starter dimension and Faen’s Retreat unlocked. I put both those dimensions into her two active dimension slots. This fits your example of 1, 2, 3 and 4. And yes, both characters can access and build in all 4 dimensions. I’m not sure if there are dimension items that are bound to character that can’t be placed in an alt’s dimension. I haven’t seen one yet. But maybe those exist. Other than that, there are no restrictions. In my question about alts visiting other characters’ dimensions, the second quote should be: “you can access and build in your alts’ dimensions with any of your characters”. Is that right? Very belated comment! Anyway, I find it pretty interesting housing in Rift is so similar with Everquest 2’s housing and at other points so very different. In fact, I wish Everquest 2 had an option of unlocking a certain house for every character in the account with loyalty tokens too! Or at least the prestige houses since those are bought with real money. 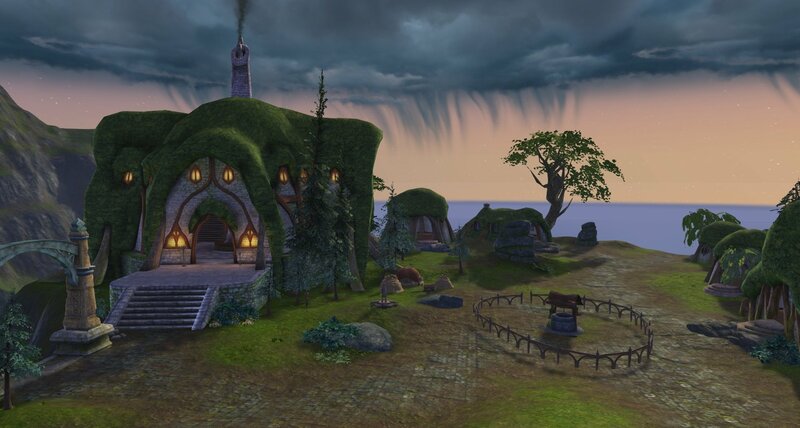 I would love to check out EQ2 housing as well and write about it. I feel it belongs here, even though I’ve never gotten into it (I did buy a house, but then left the game… ^^). It IS Everquest, after all! Also, yes, please check it out. On Zaviel-EU! ;) Okay, you’ll probably have lag, but you are invited to join my guild there, of course, and look at the empty guild dimension. Well, about the EQ2 Housing, if you are not in a hurry (and I mean really not in a hurry) I offer myself to write it as a guest post. The only reason I am asking if you are not in a hurry for it is because right now I have no house of mine decorated right now, I am still suffering from decorator’s block (it is kinda like writer’s block but with trying to build cool places) and it just wouldn’t feel right for me to write about it and not show at least one of my own work even if they aren’t as amazing as a lot of other people’s. The one with the Greek flag? Should write about player housing in ultima online. i want a good housing system thats in the actual world not a silly instance. gotta show off my pad, ya’know?